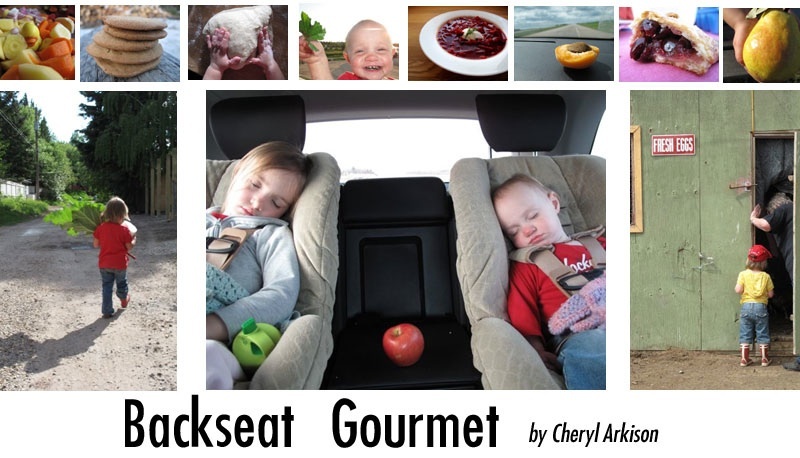 When you write about kids and food it is easy to get way too cute and brag about the latest mispronunciation as the most hilarious thing your child has ever done. I certainly fall victim to it... frequently. This week is no exception. From calling the bobcat sitting on the driveway (renos have begun!) a pomegranate, to the subject of today: macamoni and cheese. It might be a not so secret food snob goal of mine to see if I can get my kids to adulthood without a taste of Kraft Dinner. Sure, they'll be tempted along the way, but I can police all their meals at friends' and daycare, right? Okay, but I know Grandma won't give it to her, and neither will Hubby. And so far she loves what Mama and Daddy give her in the way of macaroni and cheese. For as long as Hubby and I have been together we've engaged in somewhat spirited debates about the best way to make macaroni and cheese. He in the melted cheese with a little bit of milk camp and I in the cheese sauce and baked with bread crumbs on top camp. We will happily eat each other's rendition, while secretly thinking ours would be at least slightly better. All that being said, I may have created a winner for both of us. Before I go further I need to also get another food snob confession off my chest. I don't believe in hiding vegetables in food. Sure, there are things like zucchini chocolate cake, but that's just plain good. I'm talking about the sneaking in and stalking of vegetables, just for the sake of getting your kids (or partner) to eat vegetables, a la this book. This recipe for mac and cheese, however, is one that would qualify as sneaky. I had a vague recollection of seeing something similar a few years back, but couldn't find the recipe. So I made one up. And have made it again and again and again. Use whatever cheese you have around, but the strong, aged ones are my favourites. Use whatever kind of squash - aside from a spaghetti squash - or even a pumpkin. The sauce contains more pureed squash (or pumpkin) than milk and cheese. 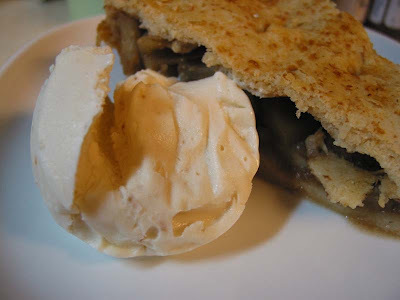 It is creamy without being heavy. It is orange! It can be eaten straight as made or baked without drying out. It is so good, seriously. Two real mom advantages of this dish are that you can feed your baby and the rest of your family at the same time. 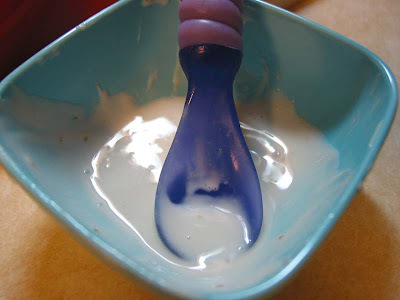 Make the puree for baby and use the rest for the mac and cheese. Plus, you can easily freeze it. I bake mine in two small pans. 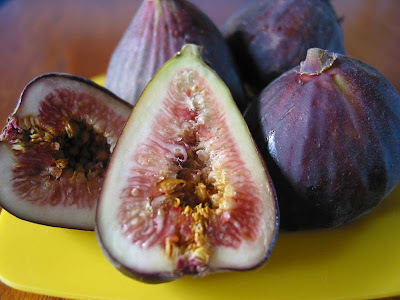 We eat one and I freeze the other for those days when Little Miss Sunshine and the Monster keep me out of the kitchen. 1. Cook your macaroni in boiling, salted water until al dente. Drain and return to pot. 2. 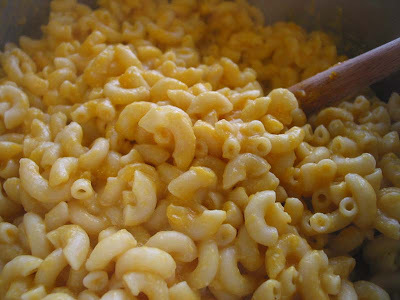 While your macaroni is cooking, melt butter in a medium saucepan. When melted, stir in the squash puree and milk. 3. When squash mixture is hot, stir in 5 ounces of cheese until melted. Season well. 4. Stir the squash mixture into the cooked macaroni. 5. If you like your mac and cheese baked, then put it in a buttered pan, and top with 1 ounce of cheese mixed with the breadcrumbs and oil/butter. Bake in a 325 degree oven for 20-25 minutes. Is there any way to style mac and cheese to look good? I'm not a professional, but I couldn't do it. Have you been watching Saturday Night Live lately? Sarah Palin and Obama imitations aside (freakin' hilarious!) on Weekend Update they have a new segment called, "Oh My God, Are you Serious?" I've been saying that a lot lately when it comes to the Monster's food preferences. Orange is one of my favourite colours. It favours heavily in the decorating in our house, I use it liberally in many quilt designs, and my favourite mug and second favourite purse are bold displays of the citrus tone. Apparently it is also one of the Monster's favourite. She, however, displays her propensity for the colour by only eating orange cheese. Oh my God, are you serious? Our suspicions about this were confirmed a few weeks ago when she boldly stated that the cheddar on her plate for snack would not do because it was not, as she said, "lellow cheese." I knew that she wouldn't eat a hunk of mozza, nor a Babybel round, having defiantly turned her nose at these for months. But that aged cheddar was fantastic, plus she'd already eaten it in a quesadilla. Still, I thought I would try an unscientific experiment on her, a cheese plate taste test if you will. 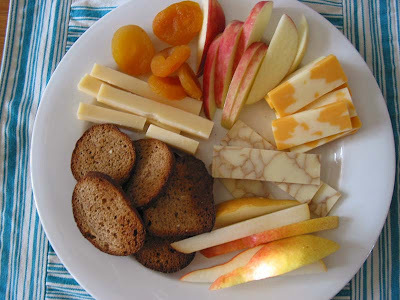 At the market last week I stocked up on some gouda from Sylvan Star, a whisky cheddar from The Village Cheese Company, and some fantastic Honeycrisp apples and Bartlett pears. Along with some supermarket marble cheese, dried apricots, and a few bagel crisps my mom left behind we had ourselves a snack. She went straight for the fruit. Okay, so maybe including the fruit skewed the experiment. But just a plate of cheese didn't seem like a good snack, plus I have to groom her for a trip to France...one day. It should be noted that the first fruit she ate were the dried apricots, shockingly orange. The volume of choices did her excited, not overwhelmed. Everything was picked up, and usually licked. Oh my God, are you serious? And all was put down, except the supermarket marble cheese. She almost took a bite of the crackled whiskey cheddar, but thought better of it. Brown is not orange. Seeing as this wasn't a formal focus group and I resisted the urge to question her choices I can only come to one conclusion: she's weird. That, or she's just a toddler. I did leave out her favourite cheese - feta. A salty sheep's feta is her hands down cheese of choice. If that is an option she will eat nothing else. Knowing that, I left it out so as to avoid skewing the results. Feta is white, or at best, cream. Oh my god, are you serious? Barring a bizarre accident with a sharp knife and raw chicken, feeding your kids should not cause you injury or illness. Or so I thought. It seems that this nursing mama has developed mastitis. Fun times. In order to give myself a chance to recover from my fourth illness (and definitely the worst) in the last month I decided to call in reinforcements. My mom came down for a few days to help us out. Today she made turkey stock from the Thanksgiving carcass, cleaned up my garden (which she planted in the first place after Little Miss Sunshine was born), took the Monster for walks, and baked cookies. Yum, cookies. 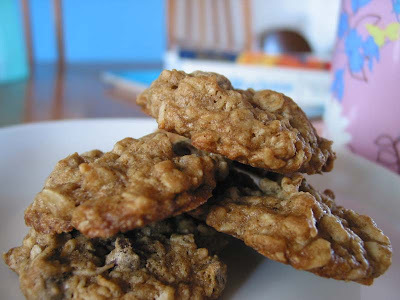 Okay, so I posted an oatmeal cookie recipe last week but these are amazing. Soft and chewy but with a little bit of crunch. Nutty without any nuts. Sweet without being cloying. Mom created the recipe after we tried some from a vendor at the St. Albert Farmers' Market a few years ago. That market is only open for a few months, so we needed to recreate them in order to continue the yummy love. After a few tries she came up with this recipe - even better than the original. My theory is that you could make it with less sugar, but they aren't nearly as sweet as you think they might be. When I make them for myself I think I will try it with only a cup of sugar. When it comes to your seeds, make sure they are fresh. Poppyseeds can go rancid easily when stored, so check any that you use before you stir them in. With regard to the pumpkin seeds, you can go with raw ones as well - with no change in flavour. Today we used roasted, salted ones because those are the most common ones found in the grocery store. We found the salted ones make no difference to the taste either. 3. Add eggs and mix well. Mix in vanilla. 4. In a separate bowl stir together the flour, baking soda, and baking powder. Slowly add to the butter mixture. 5. Add oats and mix until just combined. 6. 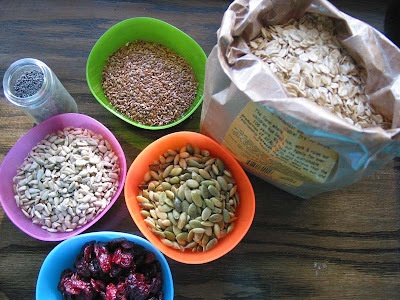 In a separate bowl combine the sunflower seeds, pumpkin seeds, flax seeds, poppyseeds, dates, and dried cranberries. Stir into the cookie mixture until well combined. 7. With wet hands roll a heaping tablespoon of dough into a ball. Alternatively, use a small ice cream scoop to form balls. Press down slightly on the cookies. 8. Bake for 8-10 minutes until lightly browned. Do you think she made the connection? It was Thanksgiving weekend. 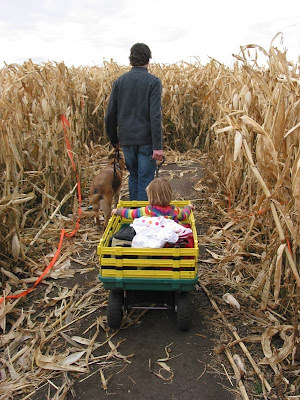 After baking, the market, and dinner with friends we decided to take a trip to the Lacombe Corn Maze yesterday. 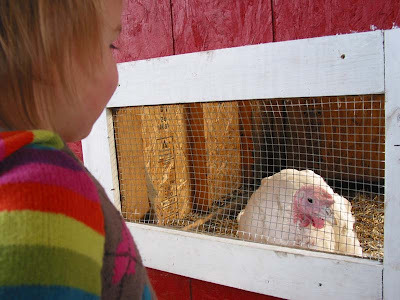 From turkey dinner to feeding the turkeys at the petting zoo there. Of course, she wouldn't eat the turkey on Sunday and all she talked about on the way home was how the turkey and the goat nipped her fingers. Perhaps she is a bit young yet, but I wonder how many parents had to explain why the two turkeys were named Christmas and Thanksgiving? We're getting better at these road trips. Rather, I should say we're getting better at packing lunches for these road trips. What better lunch on Thanksgiving than a turkey sandwich? 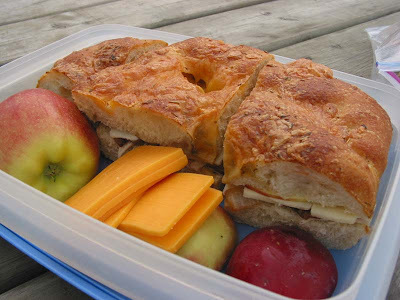 Inspired by Aimee, we made ours with an aged cheddar and apples. No onion jam in the house, but I did slice a giant onion in the morning and let it carmelize while I made some apple and pear handpies to bring. I would have loved croissants, but where am I going to find good, fresh croissants on a holiday Monday in Calgary? Hmm, where to find them any day? But I digress. The Monster isn't up for sandwiches yet, unless they are grilled. 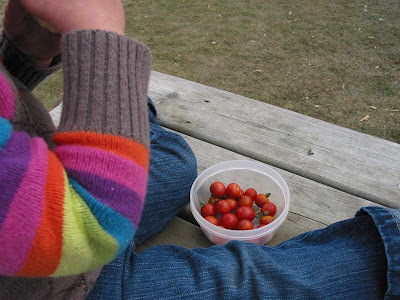 So she munched on some bread, the last of the cherry tomatoes from the garden, and a bit of chocolate. She ate so much at Sunday's dinner - peppers, carrots, apples, fruit salad, stuffing, and as much cranberry sauce as she could get from us - that she wasn't all that hungry yesterday. Kids go in such fits and starts. It can be frustrating, but I figure she will eat when she's hungry. Ultimately we were a bit late in the game for the corn maze. Frost and wind have damaged it to the point where we could see over the top of the maze. But with the Monster guiding us through the maze we still managed to get lost. We did get out in time to play on the jumping pillow, slide our way down the giant slide, and make it home in time for a dinner of farfalle with pesto, corn, tomatoes, and leftover turkey. PS We went to the corn maze last year as well, you can read about it here. My lunch just consisted of tea and cookies. Just that, nothing else. As happy as I am about the cookies, however, there is a little bit of sadness in our house today. We're out of maple syrup. Between the cookies and the baked beans I made for dinner - and the numerous breakfast of waffles over the past year - we finally polished off the 2 Litres of maple syrup we bought on vacation last autumn. My love of maple syrup means I could never be a true locovore. Sure, I've tried birch syrup, saskatoon, and even made my own blackcurrent syrup. 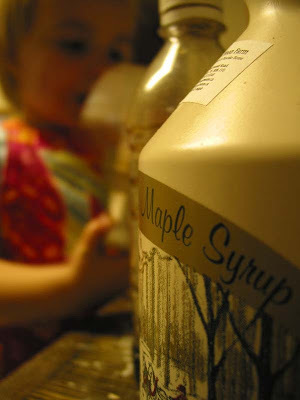 None of it compares to the simple maple goodness of a rich maple syrup. I've tried to describe the taste, but failed. You can only taste it for yourself and be enveloped by that golden brown elixir of the forest. In the morning, as the Monster's waffles are cooking she is asked if she wants syrup or jam. Well, that's not entirely true. Hubby always puts raspberry jam on them because that's what he likes. I usually ask, and she always picks syrup. And when I started being specific about it being maple syrup she started responding, "No, Buster Syrup!" 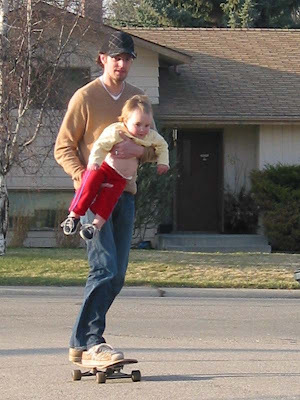 With the days getting shorter at an alarming rate it is tough to make it to the park after dinner. And when Hubby is out of town, as he is this week, I try to stay home in the evenings to save my sanity. Oddly, baking cookies with the Monster is generally a sanity saving activity. I just have to keep her hands out of the mixing bowl while it is turned on because she so desperately wants to lick the batter. I pulled out my the last of my Sugar Moon Farm syrup, my Highwood Crossing Oats, and the jumbo pack of chocolate chips (we were out of raisins). We mixed, she poured, we snuck chocolate chips, and we baked. 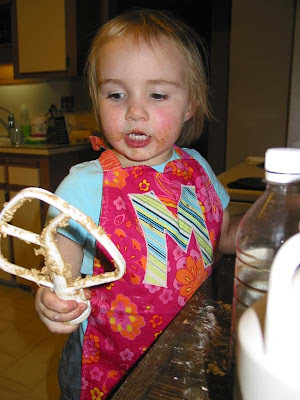 She obviously liked the batter too because that paddle was licked like it just came out of the dishwasher. And when she was done she announced that she was going to eat her hands as well. It was all I could do to keep her occupied with a dizzying amount of Ring-Around-The-Rosie while the cookies cooled so she didn't burn her tongue. After years of testing recipes and getting used to the crappy oven that came with the house I finally got an oatmeal cookie recipe that makes my heart happy. I can't lay claim to anything original about it, other than using less coconut than called for last night because I ran out. Martha strikes again. When I found this cookie recipe I had to try it. Not shockingly, it was a clear winner for me. Even if it takes away from my precious maply syrup supply. 2. In a bowl whisk together the flour, cinnamon, baking soda, and salt. Stir in the coconut. Set aside. 3. Cream together the butter and brown sugar until light and fluffy. Add the maple syrup and mix well to combine. 4. Add the egg and vanilla, beating well. Scrape down the sides of the bowl as necessary. 5. Slowly add the flour mixture to the butter mixture. 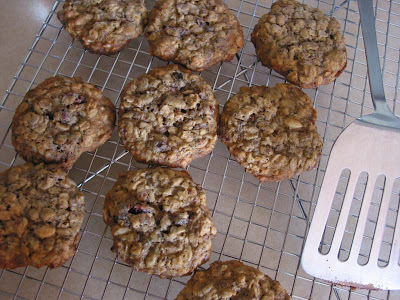 When combined add the oats and raisin/chocolate chips. 6. Form 1 tbsp in a ball and place on a greased/line cookie sheet. Birthdays change as you get older. They start as family gatherings, crowded around babies and spoiling them with cute and useless presents. Next comes the mayhem of ten kids running around hopped up on sugar and buying plastic toys. Down the line your friends change and instead of sugar your partying usually involves a lot of alcohol. Somewhere along the way your celebrations mellow and while the alcohol and sugar are still a part of things, the important part is gathering with your friends and family. We travelled to Edmonton this weekend to celebrate a slew of family birthdays. My dad turned 67 - an insignificant number (although he did say he was happy to be out of what he called a devil year) but a significant birthday because he finished chemo last week. Our nephew turned 10! He is growing up into such a good kid, not that he wasn't always. 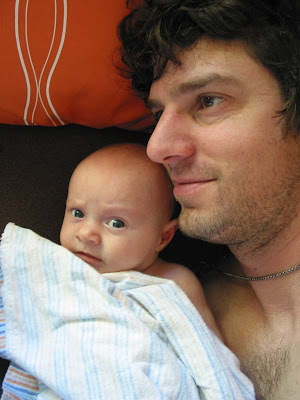 That also marks 10 years of quilting because his baby quilt was the first one I made. My mother-in-law turned 60 on Saturday. She is a fantastic woman and I'm hoping that the coming years bring her happiness because she deserves it. In all of this, perhaps most significantly, Hubby had a birthday. We reminisced about past birthdays - the crazy night at Rodney's Oyster House in Toronto, the birthday/housewarming party in our famous blue house when we were both still in school, and the hysterical night at the dive karaoke bar. This year was pretty calm, all things considered. He asked me not to get him anything and I actually listened. That saved me the hockey skate buying. But I couldn't let the day go unrecognized. Friday night at home I invited some friends, old and new, over for steaks and fire. After a casual but boisterous dinner at his sister's and brother-in-law's on Saturday I took him out to brunch yesterday. 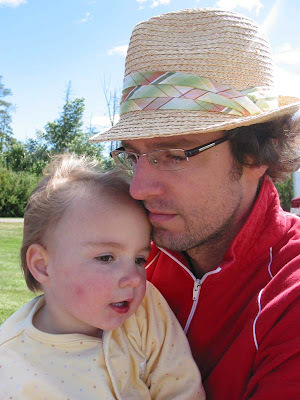 From our lazy Sunday morning when we still lived in Edmonton, just the two of us, to a friends and the kids in a hectic brunch. But the eggs benny were the same. Cafe de Ville is on the edge of Downtown, but inside the cozy space we never needed to look out the window. At brunch I usually devour the basket of warm knishes they bring you - muffins, donuts and pastries instead of a bread basket. Yesterday the Monster took care of that for me. Coffee, OJ, and Eggs De Ville. Hubby could and would order in his sleep - if the kids let him. Grilled back bacon, perfectly poached eggs that run just enough to enrich the hollandaise, and creamy roasted potatoes. It gets him every time. It's almost enough to make us want to come to Edmonton on the weekends. So there weren't balloons, fancy wrapping paper, and a case of beer. At the end of the night he was happy. Lots of kisses from his girls, hugs from friends, some new underwear courtesy of his mom, and a full tummy. At 36 can you ask for much more? I just asked him if he ever read my blog and he - in typical fashion - made fun of it. Oh well, that means he won't see these pictures on line. Just a few recent faves of my gorgeous man and the girls.